My blood sugar decided that it was going to start 2013 on a high note, a very high note. This story begins at about 10 pm, December 31, 2012. My friends and I were standing in a very long line to get in to the bar that we had bought a New Year’s Eve ticket for. Before we had left our hotel for the bar, I had tested my blood sugar and saw that it was far too high, somewhere in the 300’s. I had given insulin and assumed that it would at least be on its way down. While we stood freezing outside in this long line, I took out my dexcom and saw that my blood sugar was riding along the top of the CGM. I tested my blood sugar again and sure enough it was now in the 400s! (it should be around 110). This hasn’t happened in a very long time and I honestly couldn’t figure out why it was so high, I had given insulin for my dinner so it didn’t make any sense. Not only that, it had only continued to rise since I had given the insulin in the hotel, not a good sign. I started to get concerned. Maybe my infusion set wasn’t working. Was I even getting any insulin? I was incredibly thirsty and now I really had to pee, two common symptoms of high blood sugar. We were still a far way from the front of the line. I felt around in my clutch. That’s when I realized that I had forgotten to put an emergency syringe in my clutch when I switched purses earlier that night. I also couldn’t access my insulin pump to quickly give more insulin. That night I decided to wear a tight skirt so my insulin pump was secured around my upper thigh, not somewhere I could easily get to while in public. I had some decisions to make and I had to make them quickly. It was a huge hassle to get a cab from our hotel to the bar, with cab companies saying that wait times were over 2 hours. It was now past 10 and the bar only guaranteed our entry until 10:30. My friends would do anything for me so I knew they would go back to the hotel with me if it was absolutely necessary, but I hated the thought that we might not be able to get in by the time we got back. I thought about walking up to the bouncer and pulling the diabetes card so I could cut the line, telling him that I was having an emergency and needed to go to the bathroom to give myself insulin. Even though it was the truth, I still never really like to use my diabetes in situations like that. Plus the line had begun to move and now we were only a couple minutes from being inside. My friends were getting concerned, asking what they could do to help. Unfortunately at this point, there wasn’t much anyone could do. Within a couple minutes we made our way into the bar and I headed straight for the bathroom. My only choice was to give some more insulin through my pump and hope that it worked. I figured that if in a couple hours, it hadn’t gone down, I would then take a cab back to the hotel to change my infusion set. I made my way to the bar where my friends asked if I wanted a drink. “Just a glass of water” was my reply. I was so thirsty and downed the water almost as fast as my friend’s took their shots. I continued to curse myself for not remembering to bring extra insulin and syringes and hoped that the insulin would begin to work. After about an hour, I saw my first sign of hope. 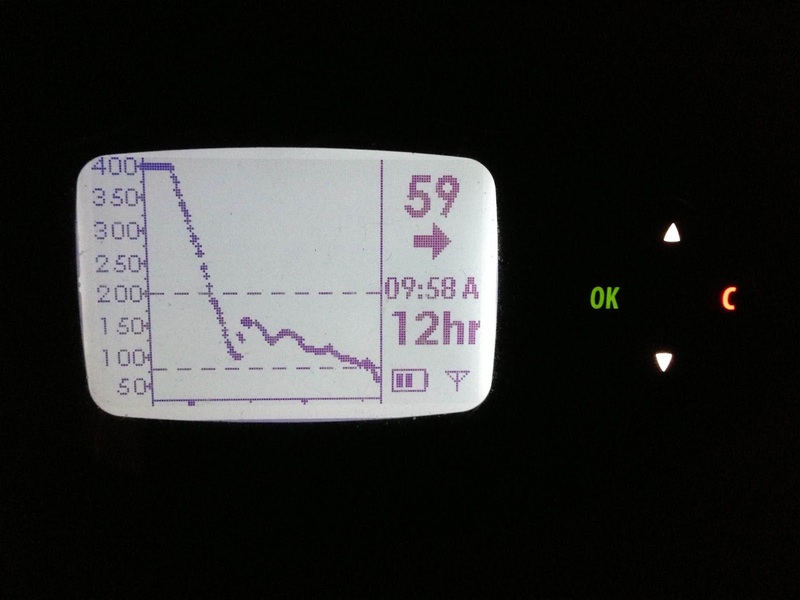 The arrows on my CGM had started to point downward, meaning my blood sugar was starting to drop! What a huge relief!! Knowing that the insulin was starting to work meant that I could stay and enjoy the rest of the night with my friends. Just as we counted down to the new year, I watched my blood sugar go down over the course of the night. It wasn’t until close to 2 am that it was once again stable in the normal range, 4 hours later! I woke up the next morning to low blood sugar, due to my attempts to lower it the night before. The whole experience was kind of a slap in the face. I had gotten caught up in celebrating the New Year with my best friends and my diabetes has taken a back seat. I still don’t know what exactly caused my blood sugar to skyrocket, but my lack of initial vigilance and forgetfulness had almost cost me my New Year’s plans, besides its effects on my health. It was as if my diabetes was yelling, “I’m still here! Don’t you dare forget about me!” I ended up having a fantastic night with my friends and am so thankful that I was able to get my blood sugar back under control without having to leave, but the whole night was definitely a reminder of how much of a central role my diabetes plays in my life and how it can never be ignored, not even for one night.